See the lush hills and beautiful landscape of Florence and other parts of Tuscany on this unique custom cycling tour! Each ride is determined by the desires and fitness level of the guests. We can visit wineries, do tastings, stop at the many cafes / bars in the countryside for coffee or lunch. We can also do a serious cycling day of 100 plus miles with 6,000 vertical feet of climbing depending on what you're into! Anywhere in the Tuscany region. It is best to keep our trips within a 50 mile radius of Florence. We'll head out for the day with a plan or see where it takes us! You will need to bring your own bike and gear or rent it. I can, of course, provide recommendations of places to rent bikes from in the area. Cost is $135 for a group of up to 2, $235 for a group of between 2 and 4. This trip was amazing. Mark is a first class guide and provides great equipment and guidance. He adjusted the tour to my ability and needs. I highly recommend riding with Mark. The tour was challenging and enjoyable. 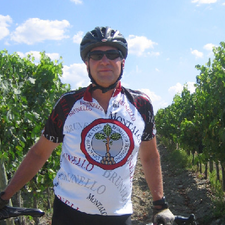 A great way to see Tuscany and get a work out in. Mark was fantastic! He met us at the train and took us back to the train station at the end of the ride. Communication from the first email to the last was incredibly prompt. This was one of our most enjoyable days out of a 14 day cruise. It was really great to see the countryside and not be around throngs of tourists. I highly recommend Mark to everyone. 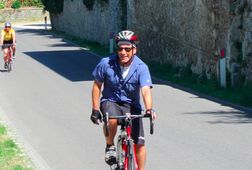 We recently spent a few days riding with Cosimo (Mark Collins) as our guide. Each morning he would pick us up at our residencia in Florence and lead us on another custom-made adventure. The rides were tailored to the skills and abilities of all the riders - we were a group of four, two couples who are old friends. Cosimo knew when to ride, knew when to rest and showed on-the-spot flexibility to alter the ride when required. He knows the backroads as intimately as possible and took us to amazing places we would never find on our own. I admit to a certain anxiety about riding through Florence and the back Italian roads but it was for naught. There seems to be a multi-use sensibility to the roads (in town and out) shared by cyclists, cars, scooters, pedestrians and the odd livestock and even wild deer. One of the highlights of the riding was our last day's descent into Florence ending with a thrilling dash through the ancient city streets and ending back at the residencia with endorphin pumping, s$/t-eating grins. If your looking for a Tuscan adventure this is the one. 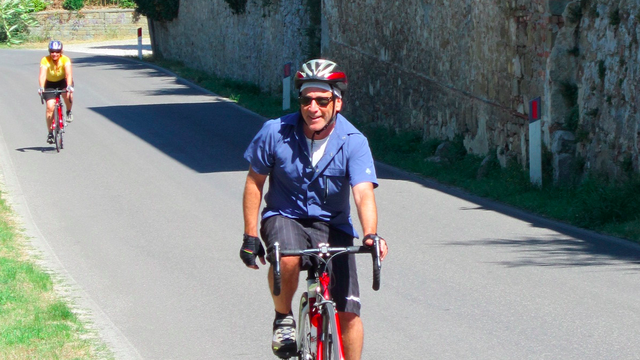 What a blast riding the Tuscan countryside with Cosimo. The riding was on par with any Backroads trips on which I've ridden, and I've ridden on a couple. The culture of Florence, the history, the bells and the glorious cuisine of the city was quite the reward after a day out climbing (and descending, wow!) the hills. The carbon-fiber framed bikes we rented came with Campy groupos (of course!) and were fitted for us before we left the shop. Cosimo (Mark Collins) knows the countryside intimately, pointing out Machiavelli's estates as easily as the roads with the cherry overlooks. Cafes, village watering spigots, immersing ourselves in the famous bike culture of Italy is all part of a day's ride. Hey, when a guide offers your wife a friendly starter push up the hill, can he be more accommodating than that? Andiamo, Cosimo! A value at twice the price!